The same 'Bull and Bear' that in the early part of the 20th century had been the after-the-close club of the titans of Wall Street. The same 'Bull and Bear' that in the '60s had been the café of choice for the liquid lunches of those 'Mad Men' on nearby Madison Avenue. "Madame," she said, "We are not quite ready!" With permission, I took a photo for you anyway. Monte Carlo is her first solo restaurant. Why the name? She grew up in the south of France on the Côte d'Azur, remembering fondly summers spent in and around Monte Carlo-- the spirit, the style, the casual elegance. 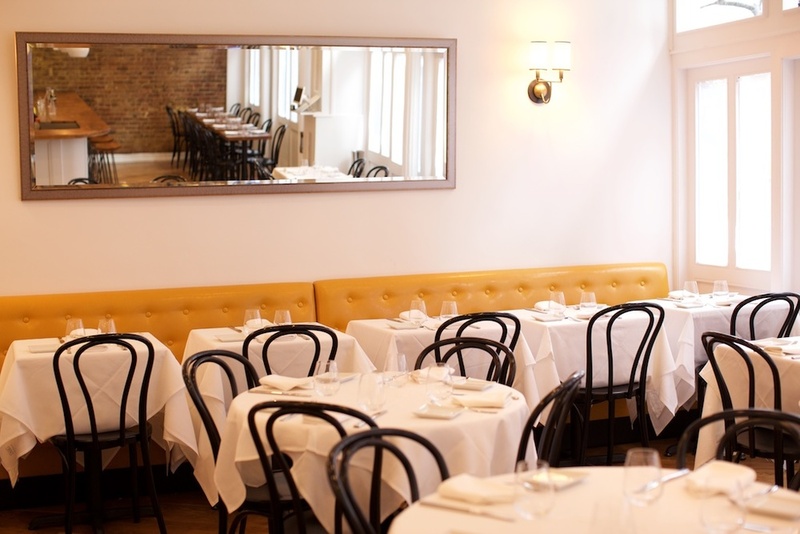 Something which she hopes to recreate in this lovely bistro on the Upper East Side. Designed to attract those in the fashion and food industry, it's also meant to please the sophisticated and demanding palates of the neighborhood clientele. Entering the restaurant last Saturday evening, we stepped into a luxe world of white—white walls, white cabinetry, white tablecloths, and a single white bloom on each table—spiked with the warm tones of the apricot banquette, the bentwood hairpin chairs, and the brick wall near the bar. At both ends of the restaurant hang over-sized mirrors, which I’ve come to think of as a classic French design element. You can see for yourself, it’s a blend of classic and modern—simple and très chic. In a word, inviting. So, too, the menu with a number of the classics of French cuisine, tweaked to please modern palates, the portions suitably sized and beautifully presented. The operating principle at Monte Carlo is farm-to-table, with an emphasis on quality and freshness. The fish is organic or wild, and the antibiotic-free chicken comes from the Amish country. Often when dining out, I find myself a tidbit to enjoy with a drink. Heading the menu under ‘To Share’ are Barbajuans, a South of France specialty with a Mediterranean twist. What are barbajuans? Deep-fried ravioli stuffed with wilted greens, ricotta and Parmesan. Or, as an alternative, salmon rillettes, a mix of fresh and smoked salmon dill served with crostini. Each is excellent. For the main course, my guest, if tempted by the skate fish Grenobloise in a caper sauce, eventually selected the lobster vol-auk-vent —poached Maine lobster and pike quenchless in a lobster jus, served with a square of puff pastry cradling the wild mushrooms. Superb. And so beautifully presented that upon seeing it, a gentleman at the next table put down his menu and said: "I'll have the same." Days later, I learned that many of the staff at Monte Carlo have come from the shuttered L’Absinthe on East 67th Street—a stone’s throw from Sloan Kettering. A long-time fan of L'Absinthe, a quintessentially French bistro of the highest order, I was heart-broken when their lease expired and the building was demolished. It comes as a relief to know that a part of that elegant bistro, the suberb staff, lives on here at Monte Carlo. Seated by the window, I part the curtains to see a Vespa—my dream vehicle for tooling the city—parked at the curb. Restaurants with street views have a charm. Monte Carlo has many charms. If it’s a perfect evening you’re after—elegant in its simplicity, decadent in its food—consider Monte Carlo. We knew it had been perfect when we found ourselves discussing it at length over breakfast the following morning. And lucky me, Monte Carlo at 181 East 78th Street, (Lex-Third) is only a few blocks from home. Hope you will join me next week, still Desperately Seeking Paris ...on the streets of New York. Until then, à bientôt! And remember... sharing is caring.